From its launch in 2015 to the end of 2017, the EIAH received 641 requests, including 300 that were submitted in 2017. In 2017, the Hub provided tailored guidance and light advisory support in response to the 56 general information enquiries received, representing 19% of the total number of requests during the year. The majority of those queries were for basic information and for proposed cooperation by consultancy companies willing to work with the EIAH. 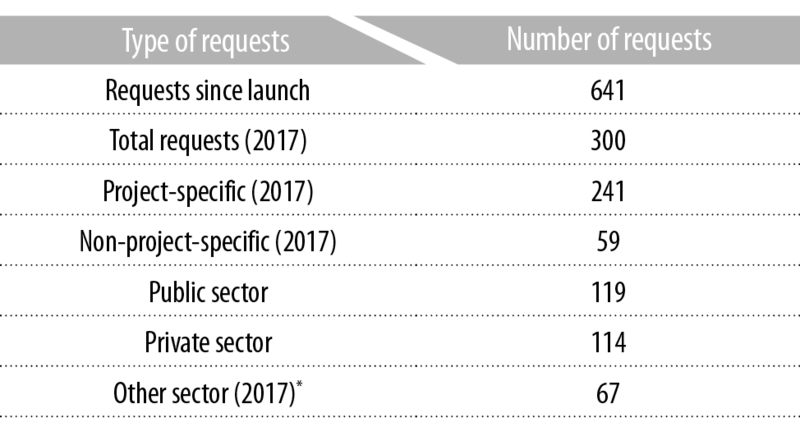 Requests for funding and financing represented more than 47% of the queries made in 2017 through the website; the requesters were provided with appropriate guidance and light advisory support by EIAH advisers or, in some cases, redirected to suitable EIB sources of expertise. 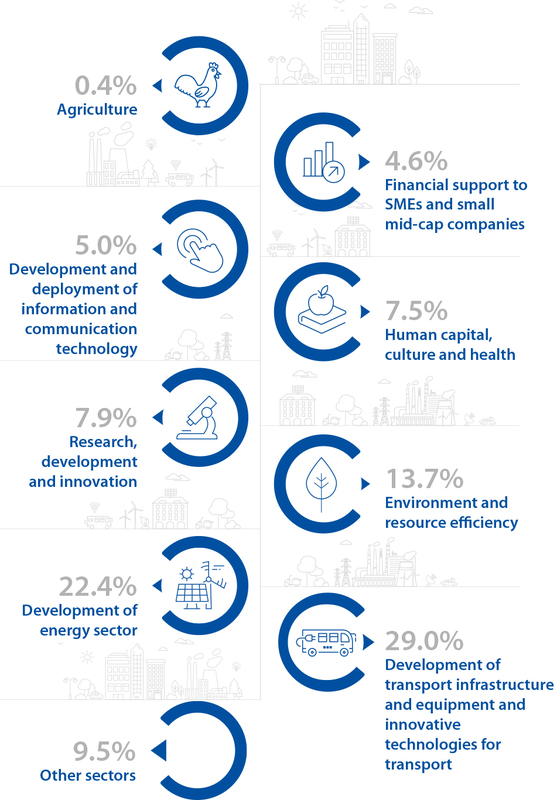 Where requesters required technical and financial advisory input to specific investment projects (more than 35% of all requests received in 2017), our advisers worked hand in hand with them to clarify the size, nature of investment, sector and stage of development of each project. This clear overview of the project’s status and its advisory needs constitutes a key basic element for EIAH advisers and enables them to act as champions of the projects internally and devise an appropriate advisory package, in collaboration with diverse EIB experts dedicated to ­supporting the Hub. Depending on the advisory needs identified with the requester, financial and technical EIB experts are called upon by EIAH advisers to contribute to the development of an advisory package. The requester is kept informed of the development of its request and participates actively in the definition of the advisory package. This process allows for the formulation of a bespoke action plan which helps project promoters in a number of ways, not only by identifying what needs to be done to make the project investment-ready but also by facilitating correctly calibrated planning of the resources needed. Once the advisory package is formalised by means of an agreement between the EIB and the project promoter, the advice is delivered by the EIAH, through available EIB internal expertise and/or through external service providers. By offering this bespoke approach to the delivery of advisory services and acting as a single point of access to advisory services for project promoters across the European Union, the EIAH confirms its compliance with Regulation 2015/1017, Art. 14.2. In 2017, we launched URBIS, a new dedicated, urban advisory platform to provide advisory support to urban authorities to facilitate, accelerate and unlock urban investment projects, programmes and platforms. URBIS has been developed in a partnership between the European Commission (DG REGIO) and the European Investment Bank in the context of the EU One Stop Shop for Cities and in support of the EU Urban Agenda. Find out more about URBIS.